At a time when the ABC lineup had plenty of decent-rated family comedies, the new John Ritter family sitcom 8 Simple Rules (initially known as 8 Simple Rules for Dating My Teenage Daughter) looked like it could be one of the stronger ones. It opened with a very good 6.1 demo rating (138 Plus) on 9/17/02. Though it quickly dropped 18% to a 5.0 in week two, it held around 5.0 for pretty much the rest of the fall, falling into the upper-4's late in the fall. Like Tim Allen's Last Man Standing, launched nine years later in the same timeslot, this show had a lot of nostalgia going for it, with Ritter and Katey Sagal both fondly remembered from iconic sitcoms past. And like LMS, this show's season one trajectory was heavily front-loaded. 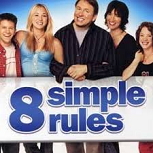 In its second episode after the holiday break, 8 Simple Rules dropped into the upper-3's and would stay there for most of the rest of the winter. And it got strikingly ugly after daylight saving time, with five of the last six episodes below 3.0. 8 Simple Rules was renewed and returned to the Tuesday lead-off role. But it was never the same again, as tragedy struck the show with John Ritter's passing due to an aortic dissection less than two weeks before the season two premiere date. He'd finished filming three episodes, and those three aired on the first three Tuesdays of the season, all with higher ratings (7.0 -> 6.2 -> 7.1) than anything from season one. And after a month-long hiatus there was another series high for the one-hour "Goodbye" episode, which averaged 20.51 million viewers and an 8.1 demo. As big as those ratings got, it was soon clear that Ritter was sorely missed. Just a week after the "Goodbye" series high, the show dropped all the way to 4.4, then to 4.2 for the last two fall episodes. Those were still good numbers, but already down from the ratings at the same time in season one. And as the show moved on from Ritter remembrances, it had a huge fall in the weeks after the new year. It opened 2004 with a 4.0 on January 6, but it shed a whooping 1.4 points in the next four episodes to end up at a 2.6 on February 10. It never again found a 3.0 rating. And though it was steady for the rest of the winter, things got very ugly once again in the last two months of the season, dropping as low as a 2.1 on 4/6/04. Ultimately, Ritter's death makes this one of the more interesting "what if" stories in primetime TV. Its struggles late in season one mean it probably wasn't gonna be a huge hit, but clearly something resonated as it remained a syndication player on ABC Family for nearly a decade after its demise. Maybe it could've been another Last Man Standing? The War of 18-49 chronicles the ratings history of veteran primetime series. For more, see the Index.